London had a red alert for air pollution seven times in the last year alone. Other major global cities have had to ban cars from city centres on some days to ease the pollution levels. The old and the unwell are dying in increasing numbers in these cities. London has also put a surcharge on diesel-powered vehicles entering the city. I live on the Ayrshire coast and like many Scots often bemoan the almost constant winds but I guess we should be glad of the air quality they produce. Recent official figures have shown that, across Scotland, pollution levels are falling dramatically. Most notably, lead levels are down by 99% since 1990. Sulphur dioxide is down 92%, carbon monoxide is down 83% and nitrogen oxide is down 71%. The massive drop in lead levels after the ban on lead-based petrol in 2000 reminded me of New York mayor, Rudy Giuliani’s claim that his ‘zero tolerance’ policing strategy was responsible for the dramatic fall in crime in the city during the 1990s and early 2000s. The claim was soon criticised by those pesky sociologists (like me) who pointed out that, due to easier access to contraceptives, there were less disaffected young men being born in the troubled ‘projects’ (housing schemes) in the previous decades and that this inevitably reduced the number of offenders from this background. Young males are, of course, disproportionally involved in crime. Further, they drew attention to research that exposure to high levels of lead. Research has shown that exposure to lead during pregnancy reduces the head circumference of infants. In children and adults, it causes headaches, inhibits IQ and can lead to aggressive or dysfunctional behaviour. Lead was being phased out of petrol in the USA from 1975-1986. You can read the story in full at the above links. So, the fall in crime, the researchers argued, was based in large part on a reduced population of potential offenders and a reduced predisposition, among them, to offend in the first place due to not having been exposed to high levels of lead in infancy. 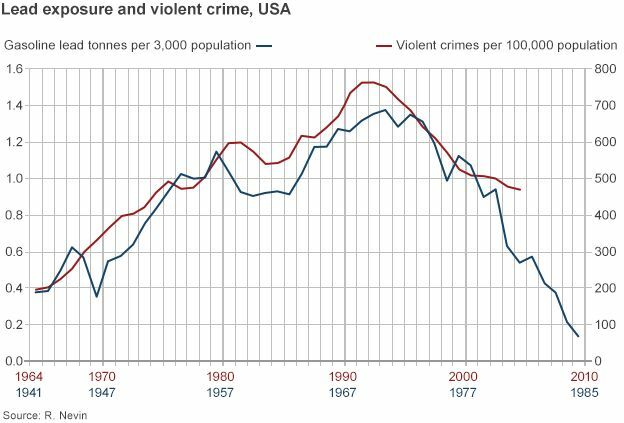 Crime has also fallen in Scotland, as it has across much of the world, in the last twenty years after climbing throughout the 20th Century. Like the New York researchers, I’m not denying entirely the effects of policing policy or other government initiatives and giving all the credit to easier access to contraceptives and falling lead levels. In fact, as you might expect, I’m going to give some credit to the SNP administration for their progressive policies which have reduced the negative effects of Tory austerity policies. I wonder, without hard evidence I admit, if the free bus pass, the winter heating allowance and free care for the elderly has maybe reduced crime by us pensioners? I do not, of course, count forgetting to pay for things a crime in the over 65s. Next Article Stormy Monday: Wind generates 206% of Scotland’s energy needs in one day! A substantial amount of air pollution is a consequence of private car use. Of course, many private cars are much more eco friendly and other forms of motorised transport such as buses and freight vehicles also contribute to air pollution. If fewer private car journeys were made – and a large proportion are under 5 miles – and people switched to walking, cycling, train, bus or even car sharing, then there would be a reduction in pollutants. However, It costs less to drive into Glasgow City Centre and pay for parking than the cost of travelling by bus. This is an example of how successful the motoring lobby has been in making the cost of private motoring cheaper than the cost of public transport (except, of course, fr us ageing welfare scroungers who have bus passes. This, of course, excludes the fact that the public purse pays for roads, repairs to them, lighting, signalling. Of course, they all claim to pay a thing called road tax, which has never existed. They pay a vehicle excise duty which permits them to drive a polluting vehicle. There are other concomitant costs associated with cars. Given the effects of things like lead on brain development, I think it is plausible that reductions in lead contamination of air can result in reduced criminality. If there were a reduction in car traffic, there would, probably, be less road rage and the consequences of that. Thanks Alasdair, many good and interesting points. I’m a keen walker and cyclist but the latter only when the streets are quieter. I live in the country about 15 minutes drive from Dumfries. There is a bus service. It goes past our house empty most times. That is because, I suspect, it is so infrequent. I’d love to use the bus more, but where we live it is impractical. Would have expected some non-drivers to live in the area but no? A lot of pollution can be laid at the door of the UK government levying tax duties of fuel either petrol or diesel. So vehicle manufacturers have spent £Millions developing high speed and low fuel consumption eco friendly diesel engines> Which Joe Public have bought in their tens of thousands, simply because of the cost of fuel /mile operating costs. Although the operational costs for running diesel engined vehicles are higher for cars. HGV diesel have the pollution contaminants regulated by catalytic converters and exhaust particle devices which reduce the harmful effect of certain of the exhaust gases. For a few years diesel engine d have had similar devices. Yet the pollution levels still rise. Is this because vehicle ownership numbers have risen, yes most families have two or more cars By 2032 fossil fuel cars will become unavailable for purchase . This observation is based purely on contaminants land based vehicles but does not include diesel engine d powered trains or more importantly pollution from oil burning sea going vehicles. These as a rule use a fuel called “Black Oil”, which in essence is unrefined oil almost straight from the ground, to truly account for all polluting forms of transport jet aircraft would need to be included in any attempt to reduce carbon pollution from oil (fossil) burning engine. But the current trend for duel fuel vehicles, the necessity to plug in to the national grid to recharge the batteries will mean a need for more generating capacity and the future all electric vehicles. It is a quandary which will require a short and along term solution without the involvement of all people concerned with the exception of politicians. Since they have had a very large part in legislation that amplified the problem. Public service transport i.e. electric.trains, electric trams and hopefully soon a return to the trolley buses of the fities and sixties. Thanks, a very interesting contribution. Aviation fuel being VAT-exempt is a scandal too.